Jaepur Bracelet was inspired by the mythical town and the jeweler's know-how. Known as the Pink Town, Jaepur inspires dreams. Its name evokes escape, the softness of life, timelessness In the 1920's, Louis Boucheron was moved by the beauty and symbolic strength of the Nauratan, a traditional bracelet offered to young brides as a lucky charm. Jaepur Bracelet echoes the alliance between the town and the jewel. It is naturally that the bottle, which evokes the bracelet, features the same color as the eternal town of Jaepur. Adorned in pink, the curved outlines of the bottle define the bracelet that they evoke. It has a cabochon, polished gem dear to Boucheron. As an ode to voluptuousness, the softness of its curves and its colors inspires sensuality and secrecy. Captivating, Feminine, Sensual, Innocent. Explore the entire range of Perfumes (EDT & EDP) available on Nykaa. 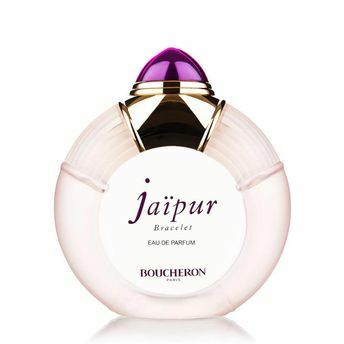 Shop more Boucheron products here.You can browse through the complete world of Boucheron Perfumes (EDT & EDP) .Alternatively, you can also find many more products from the Boucheron Jaipur Bracelet Eau De Parfum range.